The RocketRAID 2720SGL package significantly reduces up-front costs, yet retains all features of the standard retail product. SGL HBA's allow Solution Providers to configure storage platforms to meet a client's exact specifications, while avoiding unwanted expenses and incompatible cabling hardware. 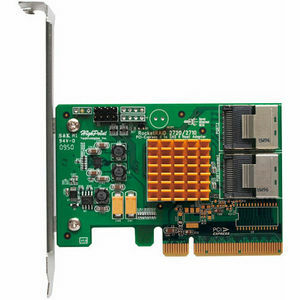 The RocketRAID 2720SGL two standardized SFF-8087 ports are fully compatible with the latest 6TB hard disks, and can support SAS and SATA devices in a multitude of storage configurations, including non-RAID JBOD's, single disks, and RAID arrays including 0, 1, 5, 6, 10 and 50. The RocketRAID 2720SGL is compliant with all major operating systems including Windows, Linux and FreeBSD, and utilizes Highpoint's Unified Web-Based Management interface, which allows both novices and experts to quickly configure, manage and monitor storage configurations.